This series was produced by Alix Blair for the Rural Advancement Foundation International (RAFI) from 2011-2012. The farm projects featured were funded by a grant program of RAFI's with support from the NC Tobacco Trust Fund Commission. Harold Wright is the third generation farming on land his grandfather bought in the 1900's. His children and grandchildren farm with him. It was once an area rich- financially and culturally- with tobacco. But when that left, the community was devastated. This is the story of the incredible project: sustainable agriculture tool lending library. Led by farmer couple George (self-declared rap listening/punk rocker farmer) and his girlfriend Kelly, this tool sharing program connects ten young/beginning farmers that couldn't buy expensive farm tools on their own but together- and with the help of Google Calendar- are succeeding. The Sustainable Agriculture Tool Lending Library came to be through George O'Neal of Lil' Farm and his girlfriend Kelly Owensby: realizing how difficult it was for George, as a young farmer, to rent or buy equipment for his farm in Timberlake, they came up with the plan to become a cooperative with ten other farmers to buy farm tools together and share. The Lending Library uses a Google calendar to manage who gets what tool when. The Library also collects yearly membership fees that go towards future tool buying, insurance, and maintenance of the tools, and different farmers are assigned to different positions (ie. secretary, treasurer...) to help the cooperative run smoothly and be self-sustaining. Learn how tremendously beneficial this project is, how easy it is to replicate, and how it makes for a stronger, more vibrant, more successful, and more educated farm community. This story is about Shannon Roberts. He lives in Western North Carolina and runs Horse Collar Farm. His family has farmed the same land for five generations and Shannon hopes to pass it on to his two sons, Tyler, 14, and Tate, 7. Shannon talks about using pasture-poultry to help your cattle herd, why other farmers in the area thought Shannon was crazy for his chicken plans, and what an impact his project has had on his community. A story of the two men who run Stokes County's Saura Pride Purple Sweet Potato LLC and how these sweet potatoes are saving tobacco farmers in the county. The Sandhills Farm to Table Cooperative is based out of Moore County. The mission is to meet local food needs with local food and that happens, in CSA style, when consumer members sign up for produce boxes. This is the story of Jan Leitschuh and Fenton Wilkinson, who initiated the cooperative and set it up in a way so that no one group (farmers nor consumers) had to shoulder all the burden themselves. The Sandhills Farm to Table Cooperative is based out of Moore County. The mission is to meet local food needs with local food and that happens, in CSA style, when consumer members sign up for produce boxes. Boxes are delivered to one of thirteen locations, called gathering sites (and you'll hear why!). Jan Leitschuh and Fenton Wilkinson initiated the cooperative and set it up in a way so that no one group (farmers, consumers) had to shoulder all the burden themselves. Sustainable Sandhills, a non-profit based in Fayetteville- created and conducted an online survey to gauge interest from the local community for produce boxes. 65% of the community expressed interest. Fenton went to the farmers with this information. The farmers, now aware of a real demand in their community, expressed interest in growing produce for the project, but needed more assurance. So, Fenton returned to the consumers and asked for a sincere commitment to the boxes, including a $25 membership fee. 400 people signed up immediately. That guaranteed farmers a market. This "ladder" model made it possible that everyone was "in this together." - 3+ tons of produce was donated to neighbors who needed it. - $18,000 contributed to 2 churches and 2 schools. - Two Business Developments happened as a result of the Cooperative: Youth blueberry farm and a two-farmer tomato-salsa joint venture. - 65% of members reported they shop more at farmers markets directly because of receiving the boxes. -81% said they felt healthier. -78% of children in the consumer member households ate more fruits and vegetables. -74% children ate and LIKED new fruits and vegetables. Sammy Koenigsberg lives in Waxhaw, North Carolina and runs New Town Farms with the help of his family. Sammy built a poultry processing facility on his small family farm for harvesting the chickens he grows. A story about this farmer's love for chickens, how financially beneficial the facility has been, and the importance of learning about where our food comes from. Piedmont Local Food is a regional food/farmer project involving multiple counties, connecting farmers directly to consumers with the internet. A story about how modern technology has the potential to save the family farm. Piedmont Local Foods is a regional project of multiple counties, though it's based in Rockingham County. Piedmont Local Foods connects farmers directly to consumers using modern technology and central drop-off/pick-up locations. Consumers place their food orders via the Piedmont Local Foods website; farmers receive the order and the order goes to a distribution center, where it's put in the consumers' individual boxes which then gets delivered to a pick-up location. Any farmer can be a member and membership is $25.00 a year. All member farmers receive a barcode printer, so when they receive an order, they print the barcode to match the order, which is scanned at the distribution center and everything's kept track of for farmer and consumer! Learn how modern technology can save the small family farm! Cynthia Sharpe and Dwain Swing run OakMoon Farm & Creamery in Bakersville, North Carolina. They've increased the agri-tourism aspect of their farm, where they offer cheese-making and goat-husbandry workshops that draw participants from all over the United States. Cynthia and Dwain talk about their goats, what it takes to start a goat farm, and how one project can change an entire local community. Matthew Garrett's a 24-year-old farmer, pretty much single-handedly transitioning a 40 acre tobacco farm to organic produce. He's in the second year of the three-year transition requirement to certify a farm organic. In this process, Matthew is also finding ways to convert old tobacco farm equipment for his organic produce needs. Matthew's had some challenges along the way, like a severe drought that cost him 37 of his 40 acres in his first year. But he's not giving up! Kay Doby, is a fourth generation farmer raised on tobacco land. Once a contract poultry grower, she now raises meat goats in her empty chicken houses. John Shaw plans to be the first commercial pomegranate grower in North Carolina. He has over 300 pomegranate trees. He has also planted 250 apple trees. He's one of the only produce-farmers in his area, with corn, soy, peanuts, and cotton being the dominant crops to grow. Meet Jefferson Herr. With his family, Jefferson runs Herr Flower Farm in Vale, North Carolina. Flower farming has become very common in Hmong communities in the Western Piedmont. Jefferson wanted to be able to grow flowers year round. He built his greenhouse, with the help of his family and friends, in several months. He'll have you over for a visit anytime if you're curious how to create your own heated greenhouse. Note: Jefferson's accent may be difficult for listeners to understand him. Meet Jefferson Herr. With his family, Jefferson runs Herr Flower Farm in Vale, North Carolina. Flower farming has become very common in Hmong communities in the Western Piedmont. Jefferson wanted to be able to grow flowers year round. He built his greenhouse, with the help of his family and friends, in several months. He'll have you over for a visit anytime if you're curious how to create your own heated greenhouse. Note: Jefferson's accent may be difficult for listeners to understand him. Steve Tate runs the Goat Lady Dairy in Climax, North Carolina. Last year was the first year of the farm's CSA. Steve learned that he grew way too much food (a better problem to have than not enough), that spinach is a tricky crop to grow, and that deer are very, very clever at getting through even the most secure deer fence. Elizabeth Gibbs and Scott Paquin run Firefly Farm in Burnsville, North Carolina. They're building a multi-purpose barn which will house hay for their herd of Devon cattle, have a calving room, and eventually be a home for their future meat rabbits. Scott and Elizabeth share their thoughts on the importance of diversity in farming, how everything takes longer than you think it will, and the importance of protecting the agricultural work happening in your county. The American Prawn Cooperative (APC) is "writing the book on the prawn industry." The APC is based in Greene County, North Carolina, and Greene County is a "Tier 3" county- meaning it's one of the most economically distressed counties. The four founding members of the APC talk about the power in a cooperative of prawn farmers to create positive change, not only in their community, but for coastal fishermen and farmers in all of North Carolina. The American Prawn Cooperative (APC) is "writing the book on the prawn industry." The APC feeds their prawn all natural feed (no animal or fish byproducts). They use no chemicals, no antibiotics, no hormones. They "don’t even treat the fire ants around the edge of the ponds." Their ponds are designated no fly zones, so that no airplanes or crop-duster planes can fly over the ponds potentially polluting the waters. And the APC recycles their water from one pond to the next, practicing water conservation. The APC will soon be certified organic and the Monterey Bay Aquarium's Seafood Watch list has voted them "Best Choice" for sustainable seafood. North Carolina has hard water—bad for washing clothes but great for prawns since crustaceans need to take calcium from water for their shells. The clay soil of North Carolina is essential for holding water in prawn ponds, and eastern North Carolina has excellent aquifers for feeding the ponds. The APC, whose processing facility is located in Greene County, bought two big steel trailers, 16 hauling tanks, and oxygen equipment (for the prawns) for their project. This equipment is invaluable because when prawns are stressed, they shed their shell which causes great damage to the animal, and so good equipment that can lessen this stress is essential. This was a "lesson learned" for the APC in their first years and with the new project equipment they've had almost zero mortality transporting their product. 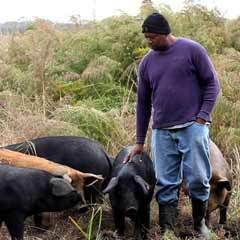 Meet Ben Haines, of Looking Back Farm, in eastern North Carolina. Ben and his father have been farming organically for more than twenty years. Most of their farming neighbors are not organic and aren't too keen on the idea. Ben shares his thoughts on the importance of a portable feed mill for his community and his philosophy on the current state of agriculture.